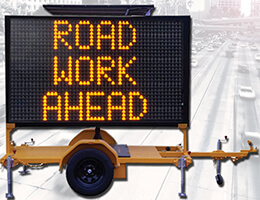 Variable Message Boards, more commonly known as VMS Boards have traditionally been a common feature in road construction zones, warning passing traffic of impending change to road conditions. In recent times, more and more businesses and retailers have recognised the advertising potential in hiring these Boards, to effectively reach a large market of passing traffic, very economically. 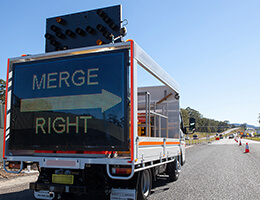 Amber screen displays ‘Merge Right’ and ‘Changed Conditions Ahead’ have now turned a once functional sign into a marketing necessity. 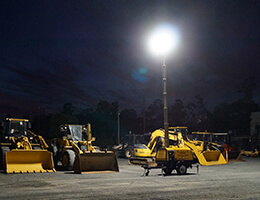 LDC Equipment have been manufacturing VMS Boards right here in Australia for over 10 years. With significant investment in R&D, LDC Equipment now offer the most user friendly, best value for money VMS Boards in the country. Today’s VMS Boards use just one core board that integrates all control functions, communications and charging systems onto a single board. This revolutionary design eliminates the complex wiring and fault diagnosis associated with traditional VMS boards. All wiring is now point-to-point from the VMS core to all other components (star pattern); the result is a reduction in possible failure points and massively increased reliability. Local control is by a user friendly touchscreen controller on a five meter lead, so the unit can be used at a safe distance from the roadway. On screen menus allow easy programming when the sign is not in a mobile coverage area. Remote access is provided through our unique VMS Director™ Software, whereby a single VMS sign or a fleet of signs can be easily managed. VMS Board features are numerous, including plug and play LED display boards, a stronger and lighter all-aluminium case with no fans to maintain, and a flat deck trailer with integrated battery box offering a lower centre of gravity for increased stability to name but a few. AMBER, 5-COLOUR, OR FULL-COLOUR LED? 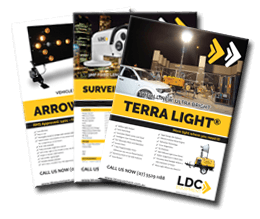 As a new addition to LDC Equipment’s increasing product range, all of our VMS Boards can now be used to alert traffic to changing road conditions, remotely. 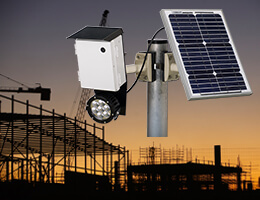 With the addition of a Solar Surveillance Camera, our VMS Boards can become a traffic warning sign in real-time. Both Camera and VMS Board can accessed remotely to view road conditions and change traffic messages at any time. The fully integrated, ultra-low powered digital camera has a 3G modem, capable of sending high res images upon motion detection or remote image capture (via smart phone/tablet). By monitoring road conditions from the comfort of your office, traffic incidences and weather warnings can quickly and easily be displayed on the VMS Board, alerting traffic to avoid certain areas, take a detour etc.